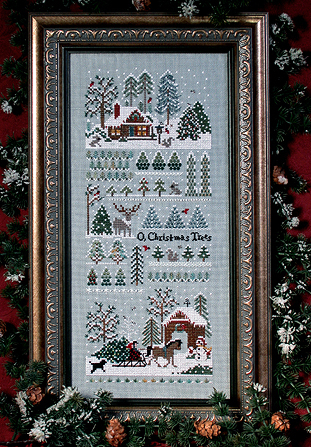 From The Victoria Sampler, this is the second in the small farm series and features specialty stitches throughout the piece. The log cabin with sparkling lights, cardinals and chickadees, lots of different trees and a sleigh ride all add special charm to this beautiful treasure. Stitched on 28 count Smokey Pearl linen with various silk threads, pearl cotton and beads. An accessory pack is available (includes everything except the whites--pearl cottons and Mori).